Let cupid make his mark. This romantic earring style features a petite heart accented by sparkling pave diamonds and baguette Sapphires. Setting sparkles with intricate cut outs and is crafted in 14 Karat yellow gold. These post style earrings secure with butterfly push backs. 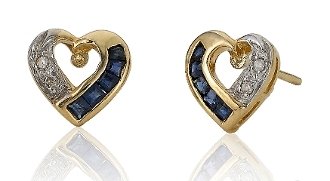 These heart studs make a perfect gift for her.